Volume is the measure of space taken up by a three-dimensional object; whereas the space within a container is known as its capacity. 1. Place your own containers in order of height. Record the order from the lowest to the highest. 2. Now put your containers in order of capacity size, from those that hold the least to those that hold the most. 3. 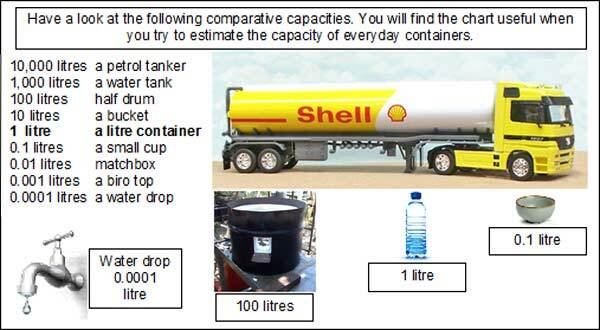 Now find the capacity order of the containers by filling them with water. 4. How accurate were you when you guessed the sizes? The week is based on a rest day, market day, or feast day. The rest day can be from 4 to 10 days apart. The 7th day, in modern times, probably derives from Assyria where every 7th day is evil or unlucky, but the Jews made it a sacred day and it is a quarter of a month. Originally a month was a moonth where the moon was a measurer of time. The moon takes 29 days to circuit the earth and this is a lunar month. January Double-faced Roman god, Janus, who looks at past and future. February Februa - Roman Festival of purification. March Mars - Roman god of war. May Maia - Roman god of growth. September Latin Septum (was 7th month). October Latin Oct (was 8th month). November Latin Novem (was 9th month). December Latin Decem (was 10th month). Which hath but twenty-eight days clear. Man has added his own time to nature. The Romans divided the night up into four watches. The Navy still operates on watches on ships. They also had long hours in the summer and short hours in winter on their sundials. However, clocks made all hours equal. The term o' clock means of the clock when sundials and clocks were operating at the same time. A minute in Latin means small. A second means the second division of the hour. The 60 minutes and 60 seconds owes its history to the Babylonians who divided 360 (the number of days that the Ancients believed it took the earth to circle the sun) into six equal parts. The shadows cast by the sun during the day became the first clock. Shadows grow shorter and change direction as the sun rises. Later in the day, the shadows grow longer again. Therefore, the time of the day can be fixed by the direction and length of the sun's shadow. The Egyptian shadow clock was adapted from the earlier crude types of shadow clock (8th Century BC). The sundial was a similar clock which was used by the Romans, and consisted of a stationary arm which cast a shadow upon the figures on a surrounding metal plate. Of course, these sun clocks could only be used during the day. The Egyptians used water clocks for time measurement during the night. These were very simple. Water was allowed to leak through a small hole in a container and the level of water went down. A scale on (or in) the container, marked in hours, told how many hours had passed. Sand clocks used a similar principal with sand, and can still be found as egg timers today. The Saxon, King Arthur is said to be the inventor of the candle clock. He noticed that a candle burned at a steady rate and so he marked them with bands. He used six candles marked into four hour bands to mark the day and night. The candles were placed in lanterns to avoid draughts. For the 250 years between 1650 and 1900 time was accurately kept using pendulum clocks. 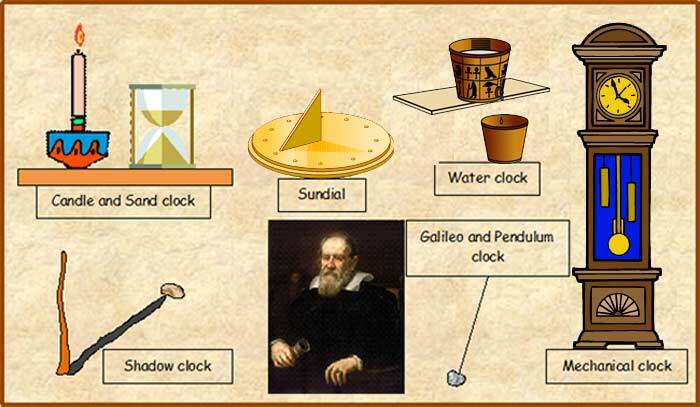 Galileo Galilei (1564 - 1642), after watching a bronze lamp swinging in the Cathedral of Piza and timing it with his own pulse, made a type of clock he called a pulsilogia. He later made a pendulum clock but died before he had completed its development. It was left to Christian Huygens (1629 - 1695), a Dutch scientist, to finish the clock pendulum started by Galileo. Of the mechanical clocks, the striking clocks are the real clocks as clokke or clok means bell (Middle English). The first mechanical clocks had no hands - they just struck a bell. Bells are still struck at the end of watches on ships, and can be heard on church clocks, and on chiming clocks. Of course, the school bell does a similar job when signifying the end of lessons and breaks. If we ask the question, "What do you usually do at 7 o'clock?" we should get two answers. One answer will be what they do in the morning at 7 o’clock and one will be for the evening. By fixing noon, or mid-day, as the dividing line between morning and afternoon, the words ante-meridian (a.m. – before mid day) and post-meridian (p.m. – after mid day) can be mentioned, although many children may not retain them. The 24-hour clock makes it possible, without using a.m. and p.m., to indicate any time of the day clearly by using four digits and a full stop. Each new day starts at mid-night. The first two digits (from 00 to 23) give the number of hours; the last two digits (00 to 59) give the number of minutes. Question: How many centimetres long should a pendulum be for a swing (to and fro) of exactly one second? Experiment by timing the swings with your watch over a period of one minute. Count out loud. What is the highest number you can reach in a minute? How many times do you breathe in one minute? How many times does your heart beat (pulse) in one minute? How many words can you read from a book in one minute? How many times can you go around a chair in one minute? Try estimating the duration of a minute. Of course, do not look at watches. Get your timekeeper friend has to say, ‘Go’. Then put up your hand when you think an exact minute has passed. Your timekeeper must keep an eye on you as well as the pendulum clock. And so is Saturday morning. If you help your parents in a shop or at a market stall, you will be better at calculating money problems at school. Bottle of water 13 26 39 52 65 ? ?